True low voltage output: Allows use of 115 or 230 VAC supply voltage on 12 or 24 VDC motors. Four Quadrant: Reverse and/or brake on the fly. Isolation: Easy interface to a PLC and added safety. Microprocessor based: Custom programming available for OEMs. Diagnostics: LEDs for power and current limit status. Flexibility: Jumpers for: inhibit personality, wig-wag, analog input range, input voltage and output voltage. 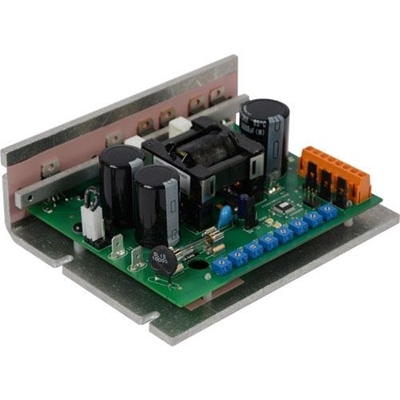 All in one package: Switching power supply and DC drive in one package. Easy Calibration: Trimpot adjustments for FWD ACCEL, REV ACCEL, FWD MAX SPD, REV MAX SPD, FWD CURR LIMIT, REV CURR LIMIT, IR COMP, and MIN SPD. Actuator Control: The standard HTL drive can be used with actuators. There is also another version of the HTL drive with I/O designed specifically for actuators.